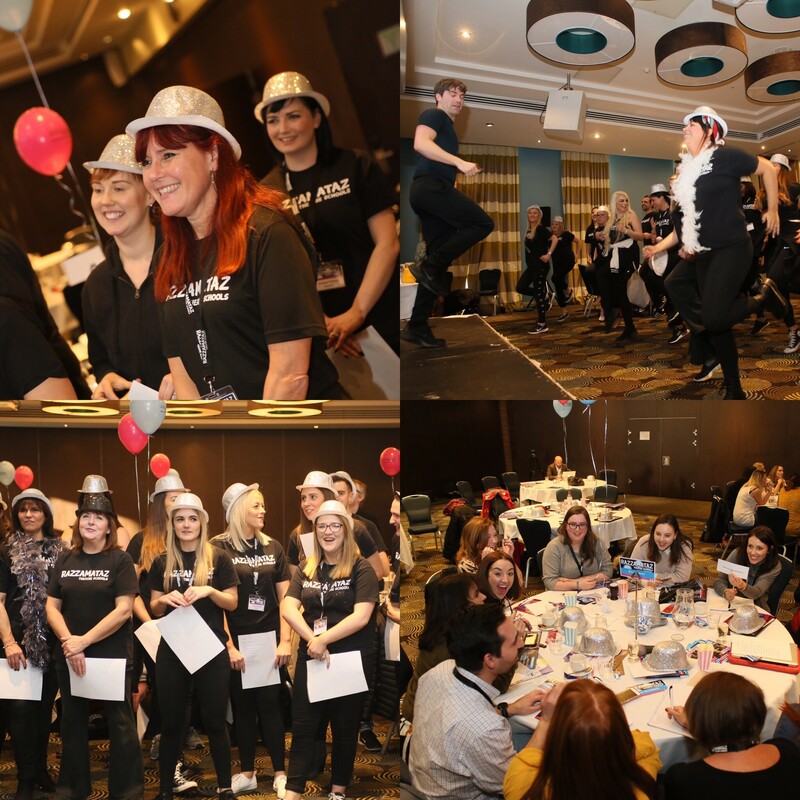 In the pursuit for outstanding, a Dragons’ Den backed franchised theatre school went above and beyond at their recent annual franchise conference. With a No Business Like Show Business theme, the franchise Head Office team went to town and pulled out all the stops to create a Conference where franchisees were able to hone their skills, network with their colleagues, listen to the latest PR, marketing and social media advice and enjoy the wonderful entertainment that was laid on. The Razzamataz franchisee Conference and Awards night is an opportunity to celebrate the achievements of the franchise network over the year. The Razzamataz franchise team has been operating as a franchise for 13 years and during the Conference, the network was able to celebrate the many anniversaries of the franchisees including a number of five-year ones, ten years and even 12 years. In fact, only circa 2% of franchisees do not renew their agreement. One of the most enjoyable parts of the day is actually hearing about the successes and challenges that Principals face on their day to day journeys. Keeping with the show theme, Phil Cole, Principal of Razzamataz theatre franchise within the Leeds franchise territory spoke about his professional background with joint Principal Jude Hill. Both Principals have long and varied careers on stage and TV and explained how they are using this experience to inspire their young students and create a PR and marketing buzz. Next to speak was Charlotte Olivares who explained her journey from work experience student at Razzamataz Medway to the Principal of Razzamataz within the Maidstone franchise territory, a thriving franchise business that has students currently in professional work on the West End stage. She also explained how being a Razzamataz franchisee has enabled her to leave her full-time job as a school teacher to pursue her dreams of being a theatre school owner and find a role that allows her creative, financial and flexible freedom. Especially important now that she is a first-time mum. Every year, Razzamataz franchise Head Office put on a ‘secret challenge’. Previous years have included a fire walk and cryptic chase. This year, franchisees were treated to a Mamma Mia! dance session with a professional performer from the show. After such a busy day, another highlight this year was the wonderful evening performance by some of the students of Razzamataz Sutton Coldfield who were selected to entertain all the Principals before the Awards celebration. They joined a host of professional performers including a stilt walker and show girls and boys to provide a fun ending to the wonderful day. To conclude a truly wonderful day and night, the Awards ceremony was a chance for everyone to congratulate the franchisees on their successes of 2018. The Franchise of the Year Award is the much sought-after award of the evening and the judges were looking for someone who shows above and beyond commitment. For the fourth year running, Hayley Limpkin and Emily Miller, joint Principals of Razzamataz Medway were delighted to accept on behalf of their students and teachers. Razzamataz are getting set to celebrate their 20-year-anniversary in 2020 and will be looking back on all the opportunities that have been created. There are lots of business prospects for a range of people looking to get into franchising and who have the enthusiasm and passion to run their own business with an established franchisor behind them. For those that have the passion, but who do not have the full experience or background to launch the full Razzamataz Theatre School, Razzamataz Early Years Franchise has been created to cater to the demand for people wanting to work in the children’s performing arts industry. “This makes the franchise much more accessible to a wide range of people who can combine it with another part-time job or looking after children, helping to support more woman and people into franchising,” says Denise.